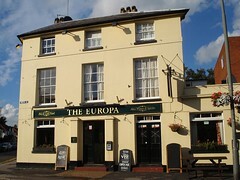 Traditional three-bar pub in East Molesey. It's divided into three areas inside, each with its own entrance. First, a sparsely-furnished room to the left houses a pool table and dartboard plus keg fonts for the usual lagers and things. In the middle is a small snug-like bar with seats for 15 or so; a sign on the internal door leading from here to the rest of the pub identifies it as the Cabin Bar. Vintage horseracing photos hang on the walls, and a framed newspaper clipping describes the history of Moulsey Hurst and the Hurst Park racecourse. There are three handpumps for real ale in here, which on our September 2013 visit were clipped for Old Speckled Hen, Courage Best (£1.60/half), and Sharp's Doom Bar. Finally, an entrance to the right leads down a corridor, past the internal door to the snug, to a larger room at the back. This gives onto a garden including an adventure playground area. Kake visited on a Friday afternoon in September 2013. There were a few other customers in when I arrived around 5pm, most of them in the back room, though one was in with me in the snug. Service was friendly and welcoming. Kake's verdict: This is a good old-fashioned pub which I'd be happy to come back to if I was in the area, despite the somewhat uninteresting selection of real ales. Accessibility: Two steps in at all three entrances. The pub has a small car park. Last edited 2015-09-12 13:59:23 (version 3; diff). List all versions. Page last edited 2015-09-12 13:59:23 (version 3).